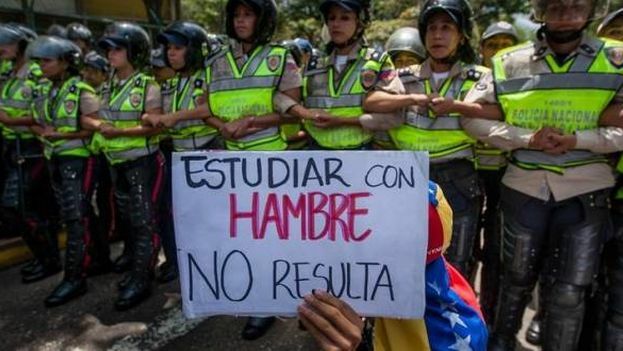 14ymedio, Miguel Henrique Otero, Madrid, 19 January 2019 — The regime headed by Nicolás Maduro kills without a timetable. It does so throughout the national territory, during the day or at night. The process that consists in depriving Venezuelans of their lives is permanent. And for this it makes use of the most diverse methods, whose results are confirmed at distinct rates. Simultaneously, they liquidated the value of the currency–reduced its purchasing power to nothing–and spread among millions of Venezuelan families the practice of eating less and less, progressively worse, progressively more sporadically. In the design of this perverse, gigantic operation, which has among its glorious antecedents the famines caused by Stalin and Mao, it has counted on the participation of advisors of Castroism and the political party Podemos. From the plan to turn Venezuela into a State of Hunger, nothing has escaped: the School Food Program ended, productive farms and companies in the agroindustrial sector were expropriated to ruin them, entities have been created one after the other to make the acquisition and distribution of food impossible, the budgets that, until 1998, allowed the operation of soup kitchens and food services in hospitals, orphanages, centers for the elderly, prisons and other institutions have been devastated. A reality that is yet to be reported and photographed: the thousands of industrial kitchens that, throughout the country, are now in useless, rusty and filthy. The most significant achievement of the “Bolivarian Revolution” in its intent of imposing a dictatorship is expressed in the politicization of the right to eat: the national identity card and the Local Supply and Production Committees (CLAP) that, in particular, act under the most implacable logic of extortion: access to bags of food in exchange for political loyalty. The CLAP system is the most widespread method of humiliation and submission of the Venezuelan society. Induced famine has an advantage: it kills slowly without its victims adding to the statistics of violent deaths. People — especially children and the elderly — lose weight, lose their body mass, weaken, fall ill and die. The structure of death works perfectly: when the afflicted citizen seeks the help of health services, he does not find it. Thus, the sick person becomes a kind of shipwrecked person: alone, lost, orphaned by the health care to which he is entitled. To contribute to this politics of death, the regime first undertook one of its most impeccable operations: it destroyed the healthcare system. A perspective view of what happened, shows the multiple factors that were put into play: politicized the performance and operations of the hospitals, persecuted doctors and paramedics, who by thousands and thousands chose to flee the country; took the right measures to create situations of extreme shortage of medicines and hospital supplies; imported from Cuba, not professionals but pirates of the exercise of medicine; and stimulated the return of diseases that had been eradicated and that have acquired epidemic proportions. They concentrated the purchasing systems in such a manner that it turned them into effective methods for corruption, acquired billion-dollar amounts of bad-quality medicines or counterfeit drugs, destroyed or stole the fleet of ambulances. They ransacked the dispensaries of the health centers, created their own factory of incompetents under the name of community doctors, allowed the hospitals to become haunts for mafias and criminal gangs; and, if my count is correct, in two decades the so-called Ministry of Popular Power for Health has had, read closely, 17 ministers, one of the biggest posters for an executive power specializing in naming ignorants and thieves as ministers. To double this process, insatiable and regularly sustained, of killing by hunger and disease, dozens and dozens of other methods are added, more apparent and occurring daily. They kill thousands of defenseless citizens, between 25,000 and 30,000 a year, at the hands of criminals who keep the cities and towns of the Venezuelan territory under control. Drivers and passengers of vehicles die on highways full of potholes, without illumination nor road signs, in fatal and incapacitating accidents. Hungry people die after eating poisonous food — like bitter yucca — in their starving desperation. Patients die in operating rooms and intensive care rooms as a result of the extensive and repeated failures of the electrical service. People die due to the lack of ambulance services and emergency care. Entire families die, dragged under by the mud and waters, on rainy days. Thousands and thousands of people die due to lack of medicines and supplies for chronic diseases such as diabetes, blood pressure, heart disease, cancer, HIV and others. Venezuelan indigenous people die, struck by epidemics. Innocents who live in the neighborhoods of the country die, killed by gang fights or by police operatives or military bodies that shoot indiscriminately. Victims die by hired assassins in charge of the operations. Citizens such as Fernando Albán are killed in torture sessions. Political prisoners die who are denied medical attention. Thousands and thousands of Venezuelans die under the yoke of a regime that hates life. Editor’s note: Miguel Henrique Otero is Editor-in-Chief of the Venezuelan newspaper El Nacional.